Rumours of a return tour have been running hot since the release of his latest studio offering late last year, and today, Chugg Entertainment can proudly confirm that the rumours are true. Few artists can boast that they’ve sold 55 million albums globally, but Robbie can. One of Britain’s premier pop superstars, known for his cheeky wit as much as his hit-studded albums, the one and only Robbie Williams will be making his long overdue return to Australia for a national run of dates this September, bringing his incredible swing album, Swings Both Ways. The tour will include Perth Arena on Thursday 11th September, Melbourne’s Rod Laver Arena on Tuesday 16th September, Brisbane Entertainment Centre on Monday 22nd September, concluding in Sydney at Allphones Arena on Saturday 27th September. It’s been nearly eight years since the British superstar treated Australian audiences to his myriad talents on the live stage. In December 2006 Williams undertook a stadium tour of monumental proportion across Australia. Having completed a colossal stadium tour three years earlier, the anticipated rush for tickets for these shows saw promoters go on sale over two days to cope with the demand, and right they were with a monstrous 9 stadium shows selling out over just one day. By the end of that tour, Robbie Williams had played to almost 500,000 Australians. Williams' love for Australia has been well documented over the years, with a slew of tours and special performances (including the 2009 ARIA awards), he can also boast his most well known collaborations being with Australians; Kids, a duet with pop star Kylie Minogue and a cover of Frank & Nancy Sinatra's Somethin' Stupid with Nicole Kidman. Add to this that 2.6 million Robbie Williams albums have been sold in Australia to date – making that 1 in 10 Australians who own a Robbie album – it’s a certainty that the love affair continues. 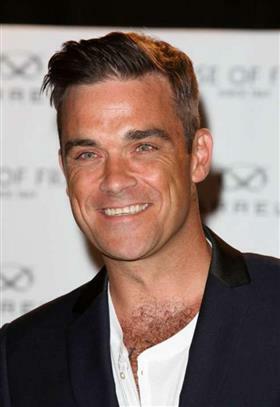 Robbie’s latest album Swings Both Ways is the follow up to his original 2001 swing release, Swing When You’re Winning, which spent six consecutive weeks at the top of the UK charts, and likewise garnered unprecedented success in Australia, going four times platinum and remaining his best selling album of all time. Swings Both Ways sees the reunion of Robbie’s collaboration with songwriter and producer Guy Chambers; the creative pairing responsible for some of Robbie’s biggest hits (Rock DJ, Feel, Millenium, Let Me Entertain You, Angels, Supreme). The album debuted at #1 in the UK and #5 on the ARIA charts, and within the first 4 weeks of release, the album was certified Gold in Australia. This is his eleventh chart-topping album in the UK, which now means that he draws level with Elvis Presley as the male solo artist with the most number one albums. Boasting an arsenal packed with ballads, pop songs and massive sing-along hits, Robbie returns to the swing genre for his tenth studio album and current world tour. Featuring a who’s who of collaborators, Swings Both Ways includes duets with Lily Allen, Rufus Wainwright, Kelly Clarkson, Michael Buble and Olly Murs. Of this latest offering, Robbie states, “First of all I wanted to do a Swing album, because I wanted to do a Swing album. I always knew I’d do another and I think now is the perfect time to do it. I’m enjoying show-biz and I’m enjoying my life and my understanding of where I am now is that there needs to be an event every time I bring out a record. The album this time is a definite ode and a loving glance towards a period on the planet that I was never invited to ‘coz I wasn’t there...I wanted to be, which I feel still very strongly linked to. Going in I planned it to be very similar to the last one, and then I realized – that’s actually not what I wanted. It’s different – it’s not all covers, I had some songs that I wanted the world to hear and check out and maybe become part of the fabric of their lives, if I’m lucky enough, that I’ve had a hand in writing. So it’s very very similar to the last one, and very different – and hopefully I’m off to romance the world!” To coincide with the release, Williams performed a special made-for-TV show at the London Palladium in December. In front of an invited audience including Adele and members of One Direction, Williams brought the house down in a lavish production featuring duets with Miss Piggy, a 30-piece orchestra, dancers and the typical irreverent Robbie shtick fans have grown to love. The show gave Robbie enthusiasts the perfect entrée into what can be expected from this welcomed return to the limelight. Advance tickets for Robbie Williams’ The Swing Tour Live in Australia will be available at the Visa Entertainment presale for all Visa Credit, Debit and Prepaid cardholders from 9am (local time) Wednesday 26 February 2014 until 5pm (local time) Friday 28 February 2014 or until presale tickets sell out at www.visaentertainment.com.au.